The guy by Lana’s side, Red Sun, is an old schoolmate of hers, Amos Aimes. As for how he got that, way, cue flashbacks. Or even, cute flashbacks. 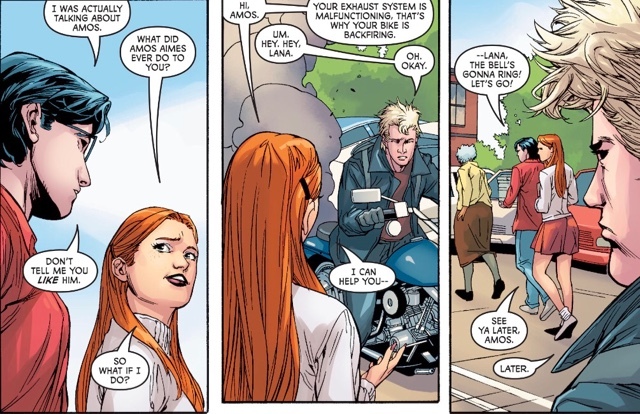 The extended sequence showing Lana’s relationships with the young Lex, Amos and Clark Kent are pretty delightful. I especially enjoy the embarrassing lengths Clark goes to in order to hang out with Lana. I like this scene of Lana and Lex having a spat, even though she's never previously been anywhere near him on the intelligence scale; where Lana wins out is in the humanity stakes. 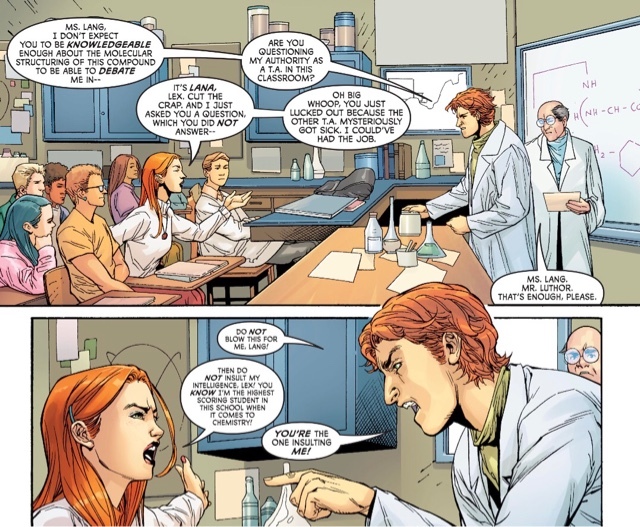 The first time we see Amos, I took him for a messier-haired Pete Ross, the best-known Smallville High pupil not yet seen, but he never shows up. I believe Amos is entirely new (though he does have a touch of Kenny Braverman, a Nineties addition to the Superman Legend). 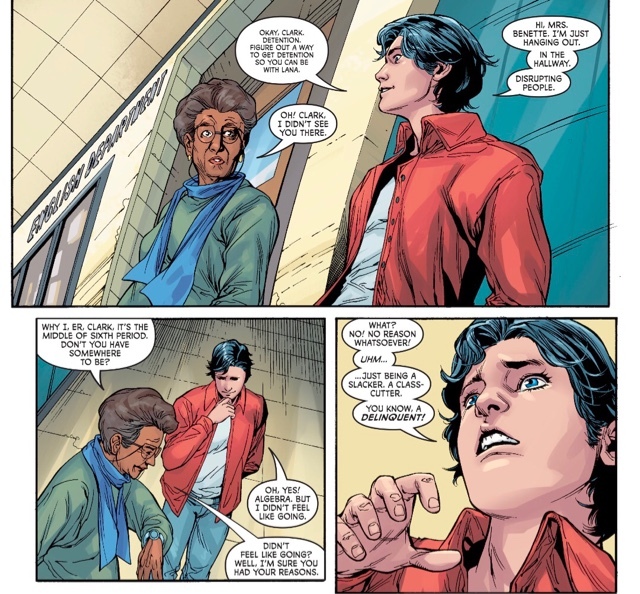 As written by K Perkins and drawn by penciller Stephen Segovia and inker Art Thibert, Amos has my sympathy - even Clark doesn't like him, and for no particular reason. We don't find out this issue, but I can't wait to find out what he's been up to with the super-powers he apparently gained alongside Lana. 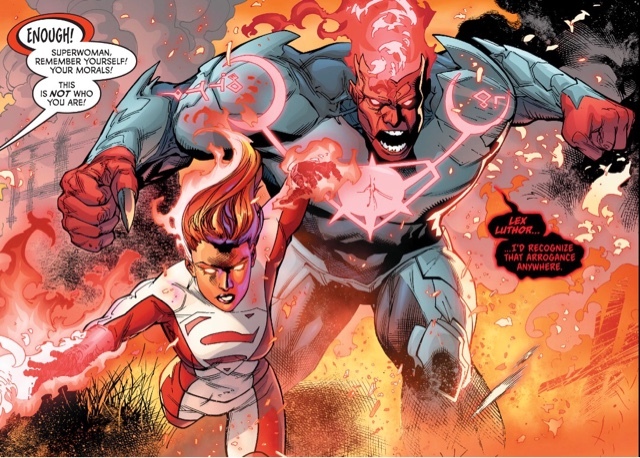 Superwoman: the Series continues to get better by the issue, with Perkins softening Lana’s temper without lessening her inner strength. 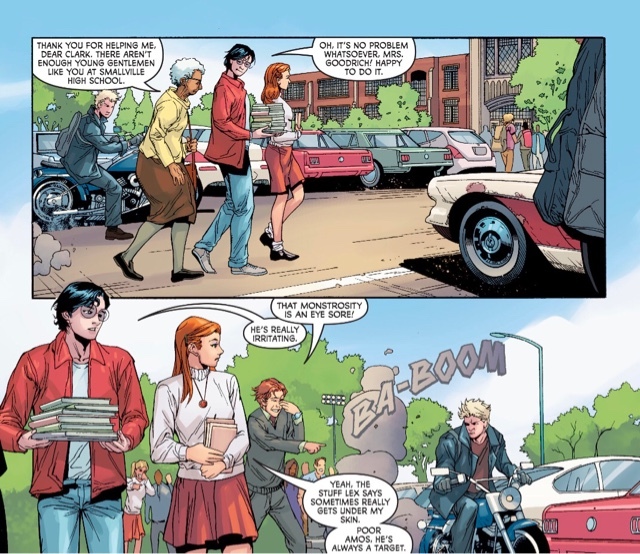 I'm not a massive fan of Smallville flashbacks, despite yearning for a traditional Superboy series, but this is very entertaining stuff; Perkins gives us high school soap without the Heathers cliches. Red Son looks like he may be a character with legs…he certainly has visual presence, as rendered by Segovia, Thibert and colour house Hi-Fi. 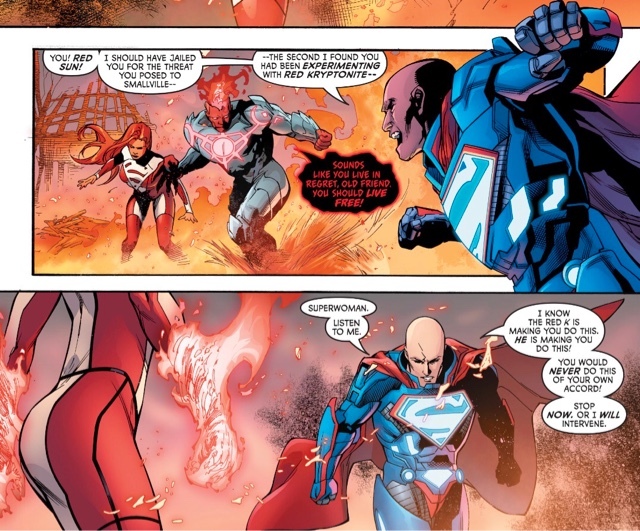 He fair flares off the page, and those chest symbols are terribly intriguing. 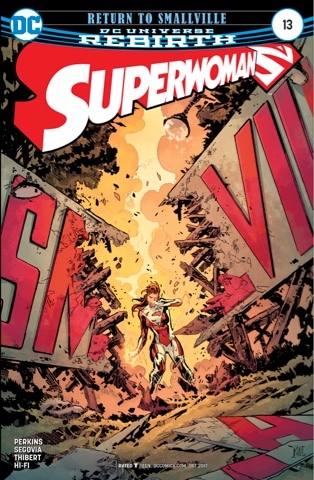 Every page is a treat to look at, especially the pastoral Smallville moments - and what's up with Segovia giving Superwoman the traditional S-symbol rather than the spicier version she's previously sported, the one that sits by the cover logo? I approve. 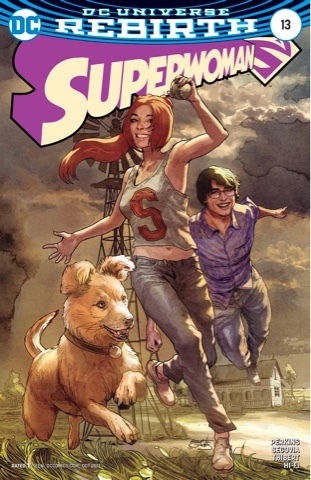 Talking of covers, Ken Lashley does a decent job with the main cover, which Hi-Fi colours, but Renato Guedes out and out stuns with the joyful alternate - there's a Gary Frank vibe to Clark and Lana, but a vibrancy that is all Guedes’ own. This series is on a real upswing - if you've yet to try it, or tried it and went away, now’s the time to sample just what the new creative team can do. Loved this issue, picking many of the same pics. And yes, Perkins has certainly breathed life back into this book. I see how Amos looks like a bad boy, but he doesn't actually do anything mean as a teen, so he gets the benefit of the doubt!